Industry leading B2B software that bridges the gap for jewellery retailers and their manufacturers. 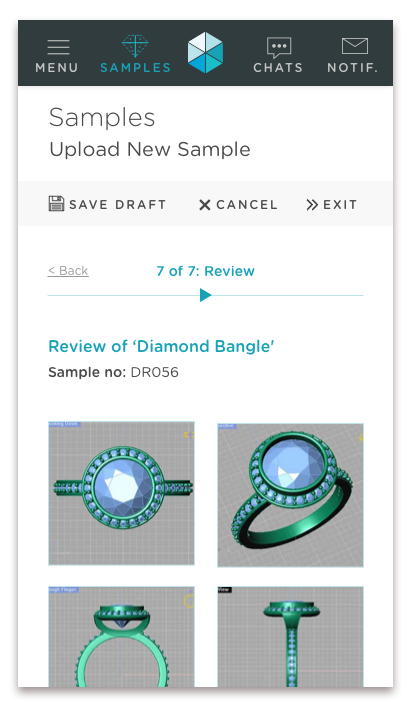 I've worked with Atelier Technology to bridge the, often frustrating disconnect, between jewellery companies and their manufacturers, through the new B2B platform, Atelier Enterprise. This SaSS aims to put an end to the archaic spreadsheet systems, shoe-horned communication methods and disjointed management of jewellery stock, for both user groups. Keep up to speed with live market information, insightful analytics and an overview of team and external interactions. Discover new designs and samples, manage products and orders, and instant chat between companies. The aim was to streamline interactions between retailers and suppliers; to provide tools to visualise new ideas, simplify the management of samples and products, handle orders and quality control, as well as easy communication between team members and across companies. A global enterprise solution for jewellery companies and their manufacturers. No more Excel, no more Whatsapp. "This software is a dream come true as it allows me to focus on the creative side of the business with confidence."